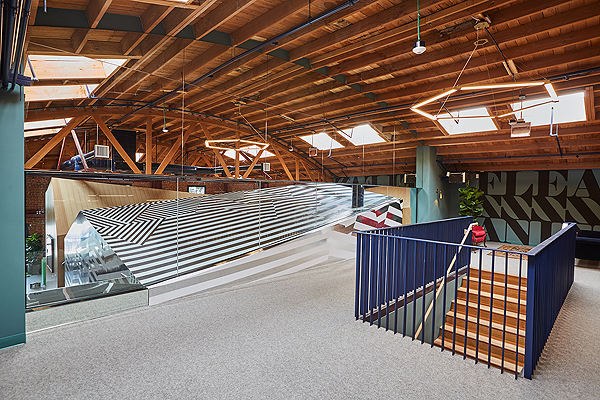 Bestor Architecture’s design for the new Silverlake Conservatory of Music at 4652 Hollywood Boulevard is a vibrant musical village enclosed within the shell of a classic and ubiquitous Hollywood bowstring truss warehouse. 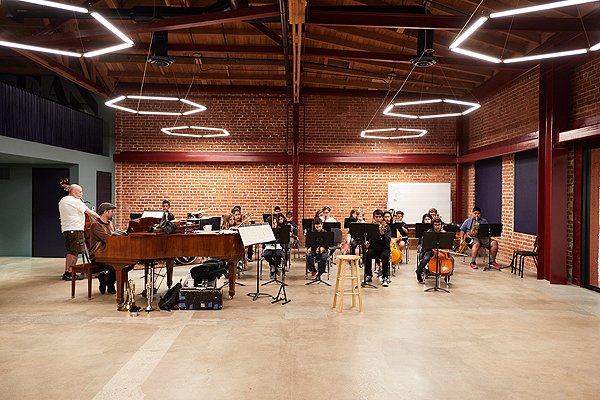 SCM, a non-profit music education center, opened their doors 15 years ago and is reestablishing themselves with a permanent new home on Hollywood Boulevard. 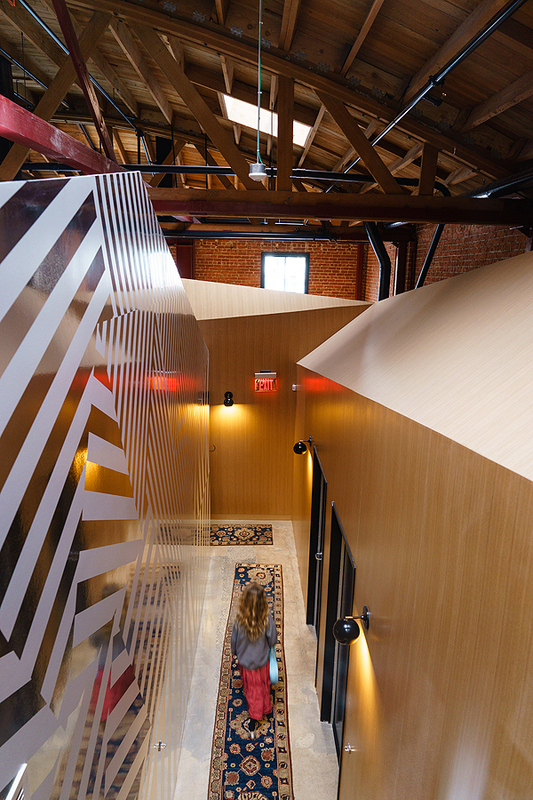 Designed to support a community of children, adult students, and musicians, free-standing pods are inserted into the warehouse to form a village-like collection of music studios, practice rooms and teaching spaces underneath skylights. 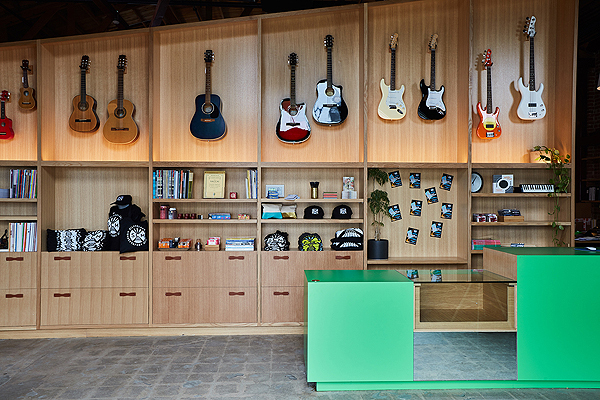 A friendly lobby and music shop opens to the street and connects to the bustle of this burgeoning stretch of Hollywood Boulevard, public transportation lines, and local schools. 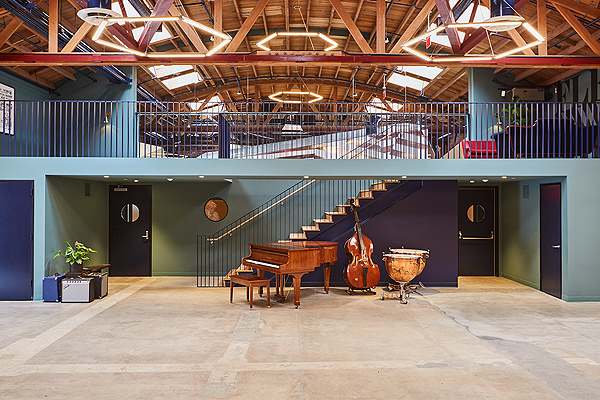 The original brick walls from 1931 have been carefully restored and the wood bowstring truss ceiling has been refreshed to bring warmth and materiality to an interior that is now a light-filled temple of music and creativity. Driven by the need for superior acoustics, the 13 lesson/practice rooms are insulated by double walls and gaskets around windows and doors. 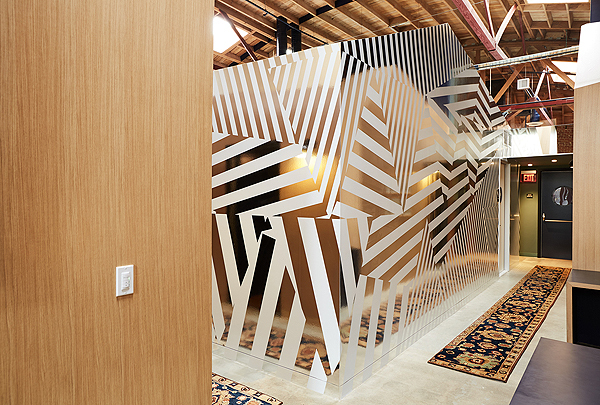 Light fixtures are made of wood instead of metal, and carpet absorbs sound from instruments. The large dedicated performance space, which is open to the public and can accommodate 150 guests, is flexible enough to showcase musical performances that range from classical to rock to choir. A parent lounge and music store faces Hollywood Boulevard securing SCM as an exciting hub of activity on one of LA’s best pedestrian streets. The adjacent landscaped parking can also be used for events and performances. There is color and vibrancy throughout the space- reflecting the energized atmosphere of SCM’s creative faculty and students. 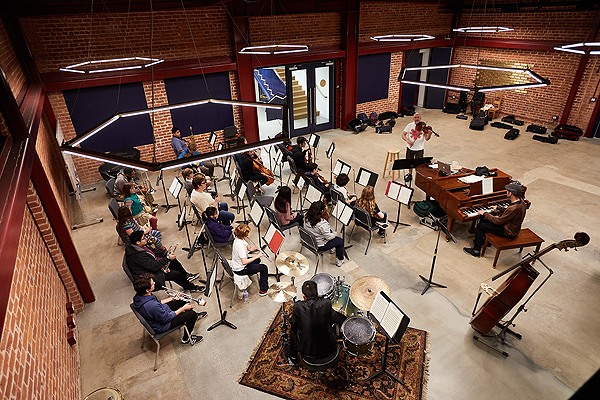 SCM’s new home triples the capacity of the old space and allows the music conservatory to double its eligible scholarship student roster and offer more music programming for the kids and adults who attend lessons at the Conservatory. 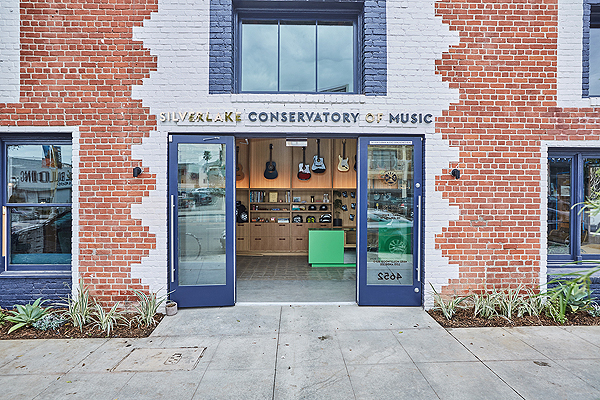 The Silverlake Conservatory of Music is a non-profit 501 c3 community music school and serves 35% of their total student body with fully subsidized scholarships for children who qualify for the free lunch program through LAUSD. 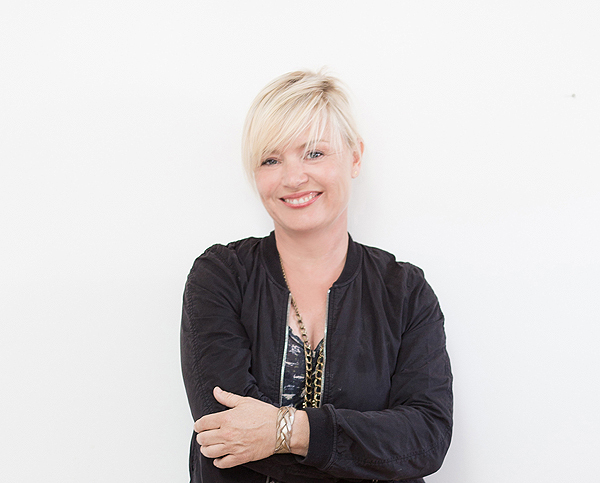 Silverlake Conservatory of Music was founded by Michael ‘Flea’ Balzary, Keith Barry, and Pete Weiss in 2001 to fill the gap in music education and provide lessons, instruments, and creative musical outlets to primarily children but people of all ages are welcome to participate. SCM provides lessons in a multitude of instruments, choirs, orchestras, and summer school and camp programs for kids, songwriting workshops and more.